Cornell Cottonmouth is a Marvel villain known for battling the hero Luke Cage. 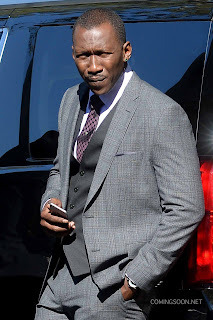 Actor Mahershala Ali will play Cottonmouth in the Luke Cage netflix series. Cornell Cottonmouth was an established drug lord in Harlem, NYC when his fate became intertwined with the up and coming hero Luke Cage / Power Man. Willis Stryker stole a shipment of heroin from Cottonmouth and used it to frame his former friend, Carl Lucas. Carl Lucas went to prison but escaped after receiving super powers. Lucas began using the name of Luke Cage and Power Man and the moniker Hero for Hire however he was still wanted for escaping prison. Luke Cage began paying informants to give him information on the heroin that was used to frame him. One informant named Flea gave him info that it was from Cottonmouth. Cottonmouth's goons had poisoned Flea and he died shortly thereafter. The goons were also able to learn that it was Luke who had hired him. Cottonmouth sees the interest of Luke Cage into his organization as a potential opportunity. He wants to add some super powered muscle and he can get that from Cage. Two of his goons (Mike and Ike) were dispatched to bring in and recruit Luke Cage. Luke sees an opportunity of his own. By joining Cottonmouth's organization he can gain information on his framing and clear his name. He agrees. To test his new recruits loyalty Cottonmouth sends Luke Cage on a mission to steal Heroin from a rival druglord, Morgan. Cage succeeds in this mission and Cottonmouth is seemingly pleased. Cottonmouth walks into a office where he catches Cage going through his records. In the scuffle that ensues Cottonmouth's adviser, Slick suffers a fatal injury. Slick is thrown from a window from the force of the battle between the two super powerful men. Cage defeats Cottonmouth and asks for the information to clear his name. Cottonmouth reveals that all of his records were stored in the mind of Slick and with him now dead there was no information left to help Cage. Cage knocks out Cottonmouth by slamming his head into a desk then calls the police to pick up the drug lord. Cottonmouth appeared again in the Shadowland and Spider-Island stories. In these stories he battled the new Power Man (Alvarez). Cottonmouth was working as the muscle for the villainess Deadly Nightshade and helped bring the new Power Man to her. He escaped with the help of Iron Fist. In Spider-Island Cottonmouth released a large group of Luke Cage villains and formed into a group called the Flash Mob. The Flash Mob then battled against a force led by Misty Knight's Heroes for Hire. Powerful metal razor sharp teeth and a willingness to use them. Actor Mahershala Ali will play Cottonmouth in the Luke Cage netflix series. Mahershala Ali was also in Hungergames Mockingjay and House of Cards.? His characters is described as a Harlem nightclub owner who unexpectedly becomes a foe of Luke Cage when his criminal dealings threaten Luke's world.